Today my friend and I drove up North to attend the Sacramento International Film Festival. As part of CineAsia we had the rare opportunity to watch two Japanese American films back to back. Little Tokyo Reporter is a short period piece about a journalist and his Japanese community in Los Angeles. Model Minority is a feature film by Lily Mariye (well know for her role on the tv show ER) and is the story about a young mixed race teenager growing up around drugs and alcohol. Although both films were quite different, they were both excellent and both films featured my friend and Academy Award winner, Chris Tashima. So after a day of watching Japanese American films, it put my friend and I in the mood for Japanese food. Being Sunday, we found that many Japanese restaurants in the area were closed. 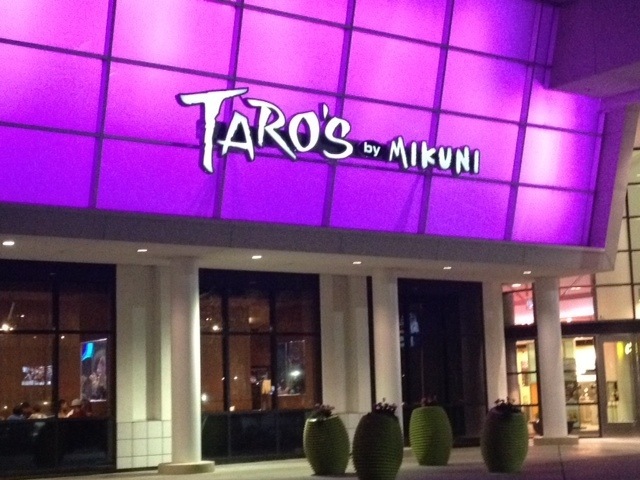 We settled for Taro’s by Mikuni. 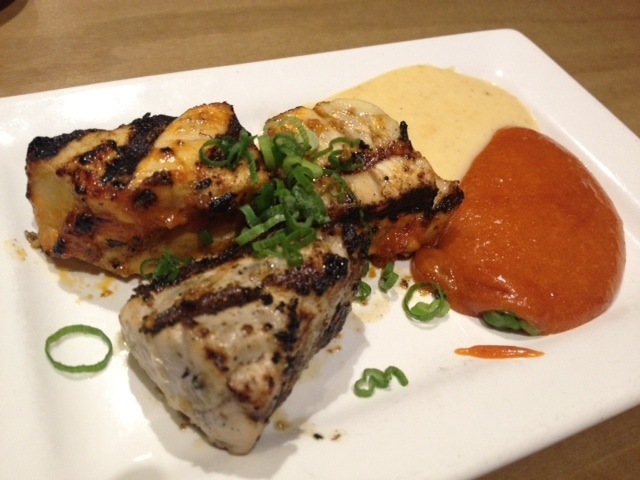 Mikuni’s has a chain of popular restaurants in the Sacramento area. 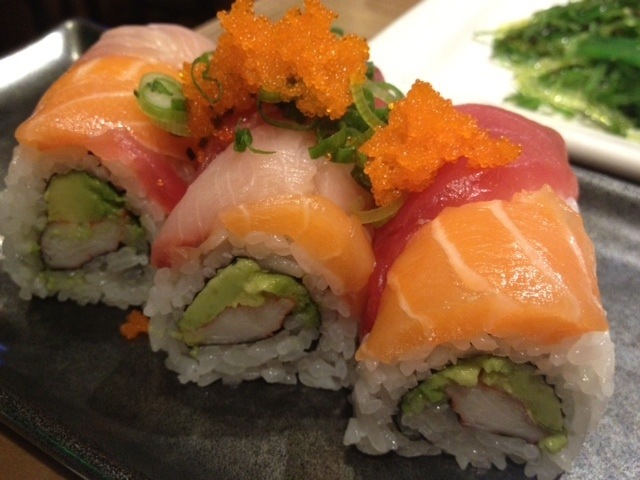 Fortunate for us, Mikuni’s is celebrating 25 years and was offering special four course meals for two for $40. We had a full page of choices to choose from. Our first course was BBQ white tuna which were large chunks of seared white tuna and served with two sauces, a creamy yellow sauce and a tangy spicy red sauce. It was quite tasty. 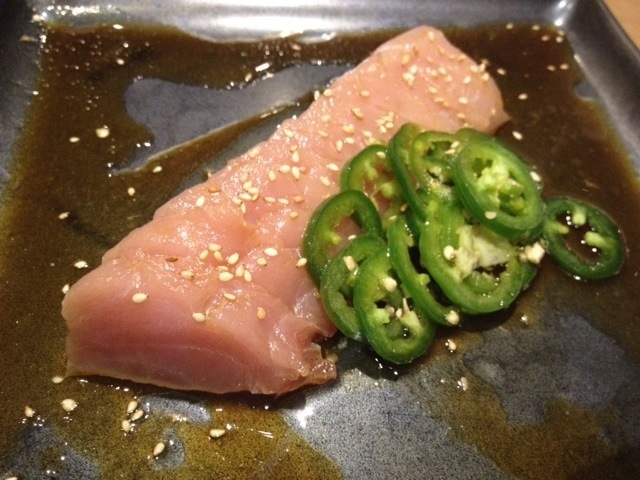 Our second course was Albacore Pepperfin which were thin slices of albacore tuna in a citrus seasoned soy dressing topped with jalapeños and sesame seeds. The jalapeños greatly complemented the tuna. The third course was a choice of two rolls. My friend picked the Rainbow roll, which was essentially a California roll wrapped with tuna, salmon, and yellowtail. 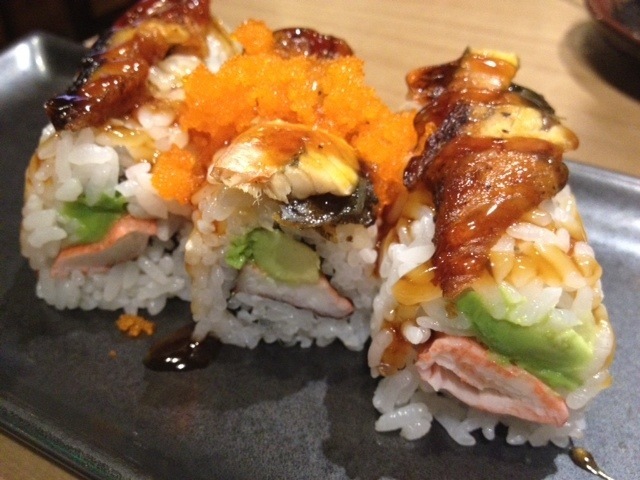 I chose the Una-Cali roll which was a Californian roll topped with eel. For the two rolls, they used crab legs. 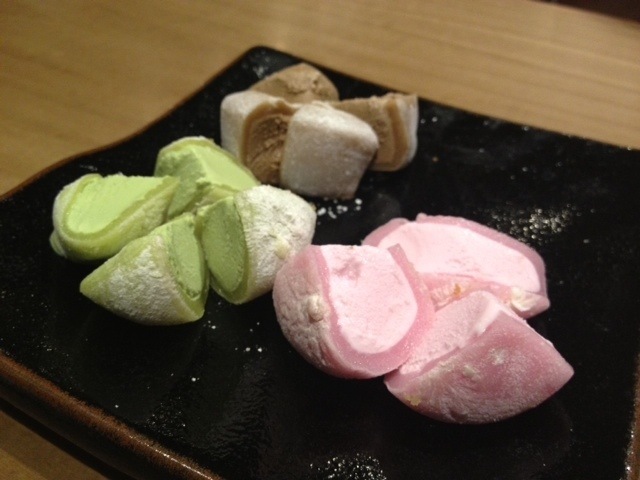 Our forth and last course was a selection of three flavors of mochi. We chose strawberry, green tea, and coffee. Between the mochi and watching the Golden State Warriors win again, Taro’s by Mikuni was a nice way to end the evening in Sacramento. Nice. I remember the days when there was only one Mikuni’s. You can even fund one now at Northstar at Tahoe. Oops, find one. If you can fund one, that is even better.